Just as I receive an email, without having to call them, from Eskom telling me that my account has been restored to a more reasonable balance (just briefly: our meter “cycled” over 100 thousand, but their system can only handle 5 digits, so the intelligent person entering last month’s reading just chopped off the last digit, but then their system miraculously added that back to 100 thousand, somehow now able to handle the 6 digits just fine, thank you very much, resulting in a usage of 10 thousand kwh instead of 2 thousand), our phones go dead and our internet stops working. And I was so happy returning back to Africa and its blue skies, after our mystery trip I was bursting to tell you about. Well, Africa for sure gave me its warmest welcome, didn’t it. And, alas it was just MY internet and phone. All of our neighbors were perfectly happy. That is the strange thing about living in Africa. Joint suffering is so easily borne. The robot coming out from our neighborhood hasn’t worked in months. Remember my long story about how I called the City of Joburg to complain about that when it happened the first time? Well, I no longer even entertain thoughts of calling anyone. And I’m sure everyone else feels the same way. Do you realize there is a slight chance that the City of Joburggenuinely doesn’t know it’s down, because out of thousands of people stopping there every day, not a single one has thought of calling them? But not so with our phone. Ours being the only affected household, from what I could gather, spurred me into action. Not that my action did much good, as we have been offline for almost a week. What I really need is another Richard. Just the thought of him warms my heart and makes me fall in love with him all over again. Sweet Richard who always answers on the first ring and gives me the verbal equivalent of a foot massage every time we speak. I need someone like him at Telkom. For now, I’ve just had a succession of customer service reps, one stupider and less-caring than the last – if I’m lucky to get through at all – who usually hang up on me before I can state my case completely. 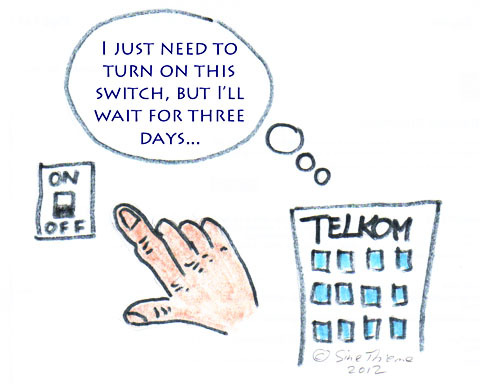 But the question is, can I really handle Richard at Eskom and a new best friend at Telkom all at once? That would be an impossible love triangle. Or rectangle – it now occurs to me that our cable TV with Multichoice has been awfully quiet lately. Not to mention water and trash. VOICE MAIL: Welcome to Telkom. If you are an existing customer, please press one. VOICE MAIL: Please note that calls to this number are free of charge if you are calling from your Telkom line. VOICE MAIL: Please enter the 10-digit phone number you are reporting the fault for. VOICE MAIL: Please note that a service fee may be charged for the callout if the fault is not related to the Telkom line. Please continue to hold if you agree to that fee. VOICE MAIL: To report a fault, press one. FEMALE VOICE: [after 10 minutes] This is Mpumulele, how can I assist you? ME: Our phone line is dead and our internet is not working. FEMALE VOICE: What is the phone number of the account? FEMALE VOICE: Let me check in my system… Ma’m, it says that your ADSL line is working. So your internet should be fine. Do you still with to report a fault on your phone line? ME: But both internet and phone are not working. I’ve had dozens of these conversations over the last few days. Sometimes I never make it to a real person, ending in some obscure voice mail purgatory in the form of an endless loop of pressing “1” and entering my phone number. Often, when I finally make it to a real person, she hangs up on me just at the crucial moment where I’m expecting to hear what they’re going to do about it. I’ve collected an impressive stack of reference numbers, yet when I call back to check on the status, I’m never asked for any of them. After briefly restoring our line, it was out again after just a few hours and we’re back to waiting for something to happen. To add insult to injury, after five days of no service, I got a call from Telkom performing a survey about my recent service experience with them. I’m a patient person, I really am, but that was a bit much. Though it was kind of satisfying to dish out a series of “1”s in answer to “on a scale of one to ten, how would you rate…”. Oh, but I can see it clearly now, it’s just another Richard being thrown at me to soothe and let off steam, without ever solving anything! I really don’t know if I can handle another Richard. How Many Cattle does your Household Own?